Meanwhile, cut sweet potatoes into small cubes and spread into single layer on greased pan. Add tilapia fillets to greased pan as well and sprint sweet potatoes and fillets with Trader Joe’s BBQ rub with coffee. I was able to use one large baking sheet and put the tilapia fillets at one end, and the sweet potatoes at the other. You could also use two small baking sheets and keep them separate. Once you’ve added BBQ rub with coffee, flip fillets and add to other side, toss sweet potatoes to evenly coat. Bake for 9 minutes, remove pan and flip both tilapia fillets as well as sweet potato cubes. Return to the oven and bake additional 2-4 minutes or until sweet potatoes are tender and fillets are cooked through. For mine, they were ready at the same time. Allow fish and sweet potatoes to cool a few minutes, then add Trader Joe’s All Natural BBQ sauce (or BBQ sauce of choice) to tilapia and break apart into small pieces, tossing to coat evenly in BBQ sauce. 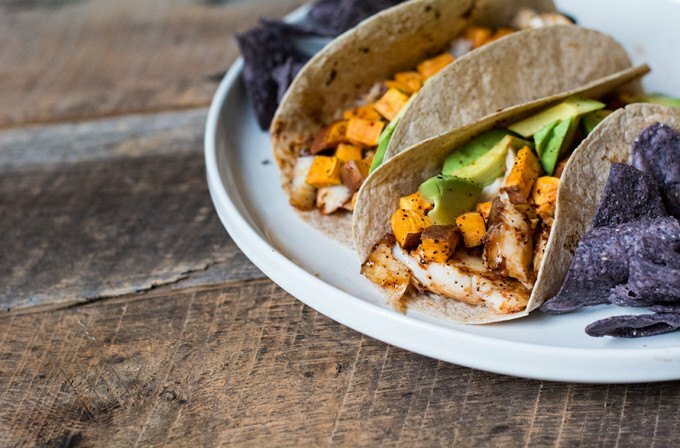 Then assemble your tacos with baked tilapia, sweet potatoes and avocado or other toppings if desired.